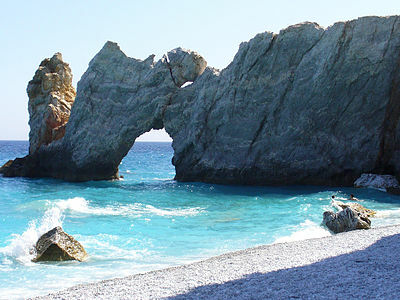 Skiathos (Greek: Σκιάθος, Skiáthos) (population: 6,088 ) is the entry point and main island of the Sporades Islands. Although it is neither the biggest nor the most attractive of the Sporades islands, because it is the first port of call for most ferries and possesses the sole airport, most tourists don't venture beyond Skiathos. For most, why would they want to? There are great beaches, good accommodation on offer, and decent public transport. In season, the 5000 or so natives are vastly outnumbered by tourists from around the world! The island is served by the 39.177523.5036751 "Alexandros Papadiamantis" International Airport (JSI IATA). The airport is situated north-east of Chora. It is served from Greek destinations by Olympic Air, and from northern European destinations in summer months by charter and some regular scheduled airlines (including Austrian Airlines,) usually only once or twice a week. The ~1600-m runway is an excitement in itself; as you descend towards Skiathos you are met with sea, sea and more sea before out of nowhere appears a precarious strip of runway across the end of this small island. If the pilot misses his spot, you’ll have to circle and try again! If you start a day-trip with a moped, make you sure you do so on a full tank, as gas stations are sometimes hard to find. An extra stop at a gas station can save a lot of nerves. When renting a moped, check if the profile of the tyres is ok if the brakes work properly,lights,turn indicators and petrol gauge. If it doesn't look good don't be bothered to rent it, it could be the one that needs a repair badly. it can cause you a lot of troubles if it breaks down. Make sure the insurance stands on the contract. Helmets are required on Skiathos. The First Rent a Car and Motorbike, ☎ +30 24270 22810, +30 6942443165, e-mail: info@skiathoshire.com. Delivers and picks up your car or motorbike to and from the airport, Skiathos Harbour or your hotel. Has a large selection of the cars, jeeps, motorbikes and scooters for rent. 39.1630623.490181 Alexandros Papadiamantis House Museum, Papadiamanti Street (Skiathos main street) (after 100 meters at a small alley on your right), ☎ +30 24270-22240. Tu-Su 09:00-13:00, 17:00-20:00. Alexandros Papadiamantis (1851-1911) is one of the greatest ever Greek authors. He wrote over 100 novels mostly based on island life. His house has been turned into a museum. 39.2094723.460592 Kastro. Site of the medieval center of the island. Abandoned in the 19th century (1829). There are well maintained three churches and a house, the other buildings are dilapidated. Most people come to Skiathos for the beaches. Let's face it, there is not much else to do on the island. However, there is a large, forested interior that can be explored. Yachting. Skiathos has a large port from where one can charter yachts either for day trips or longer periods to explore the surrounding islands. Puresailing Yachting has a selection of yachts for this purpose. Colorful sea shells are a popular souvenir item, but very many of them are imported, and have no connection to the island. Many brand name products for sale in the tourist shops may be fakes and/or unlicensed (t-shirts, towels, hand bags, and so on). Besides the following listings, there are numerous Souvlaki (Greek kebab sellers) dotted around the island, and frozen yoghurt is increasingly available on Papadiamanti St.
En Plo, Skiathos Town. (200 m. from the port to the airport. ), ☎ +30 24270 24433, fax: +30 24270 24433, e-mail: info@enploskiathos.com. 17:30 - 00:30. Seafood. Marmita, Evagelistrias 30, ☎ +30 24270-21701, e-mail: marmitaskiathos@gmail.com. Simply fantastic Greek food (albeit not typical tourist fare) in a lovely courtyard setting. Off the beaten track, so fewer tourists and more Greeks. €15-20pp. Medousa, Old port. Italian restaurant, with wood-fire oven. There are various hot club locations, though most famous clubs are located north-east of the port at around 300 m, by the seashore. JasmineVillas, Troulos, ☎ +30 6973919002, e-mail: info@jasminevillas.gr. Two villas offering island views supplied by a warm & friendly family. The Jasmine Villas offer private swimming pools with sea view, a large patio with very pleasant gardens, useful facilities such as bbq and private lot for your vehicle. Jasmine Villas are luxurious, modern, and well equipped. Atrium Hotel, Agia Paraskevi, ☎ +30 24270 22258, fax: +30 24270 49444, e-mail: info@atriumhotel.gr. Four-star hotel on the lush island of Skiathos, in full harmony with the landscape. Bourtzi Hotel, Moraitou 8 Skiathos Town 370 02, ☎ +30 24270, fax: +30 24270, e-mail: reservation@hotelbourtzi.gr. 4 star modern boutique hotel in the heart of Skiathos town, in a very peaceful area. Dabasi Hotel, Skiathos Town, ☎ +30 6978 701571, e-mail: info@dabasihotel.com. Complex of furnished studios and apartments available for rent year around. Skiathos Princess Hotel, Agia Paraskevi, ☎ +30 24270-49731, fax: +30 24270-49740, e-mail: princess@santikoshotels.com. Deluxe hotel on the white sandy beach of Agia Paraskevi. [dead link] Skiathos Repos, Agia Paraskevi, ☎ +30 24270-23831, e-mail: info@skiathosrepos.gr. Skiathos Repos complex consists of two villas in Platanias, Agia Paraskevi in Skiathos. Villa Elpiniki, Troulos (Near bus stop 19), ☎ +30 24270-49441, fax: +30 24270-49441, e-mail: kostas@villaelpiniki.com. Check-out: 11:00. Rustic holiday flats. Simple and cheap accommodation that is close to the beach and the bus stop. On top of a hill which means there's more of a breeze, and fewer mosquitoes - the downside is the steep walk required to get up there! 10 min from the beach, next to bus stop 19. Kostas, the owner, is helpful and friendly. From €40 pp per night. Skiathos is a generally safe destination. As with all Greek islands, the summer sun is very strong all day. You should not take the risk of dehydration, sunburns or even heat strokes lightly. Wear appropriate clothes, a hat and sunglasses; use sunscreen; bring enough water on excursions and know when to stop exhausting yourself and seek the shade of a tree. Greeks take it easy in the middle of the day, from 2-5, often only venturing down to the beaches in the late afternoon and early evening. Then aircrafts taking-off, the engines are in full thrust, directly on you. So then an airplane taking-off get a cover behind the wall on the other side of the road, or if you are adventurous person grab the Armco barrier and low your profile, the exhaust gasses can throw you hundred meters away. Cover your face also, very often the gasses lifting items like a tiny gravel, you don't want such a encounter that could ruin the enjoyment. Flights to Athens are short, and daily. This city travel guide to Skiathos is an outline and needs more content. It has a template, but there is not enough information present. Please plunge forward and help it grow! This travel guide page was last edited at 11:54, on 13 January 2019 by Wikivoyage user Traveler100bot. Based on work by Wikivoyage users DocWoKav, Wrh2Bot, DaGizza, Ground Zero, Inferno986return and Ikan Kekek, Wikivoyage anonymous users 165.225.80.60, 79.75.143.234 and 178.59.174.117 and others.